Clevedon Wells Fryer was born on 11 August 1892 in Frampton, one of the thirteen children of Albert Fryer and his wife Flora May née Hitchings. By 1901 the family were living in Elm Tree Cottage on the corner of The Green and Whitminster Lane. Clevedon worked as a gardener after leaving school. On 7 June 1915 he was posted to the 186th Brigade, Royal Field Artillery; this was part of the 39th Division on the Western Front, and was equipped with howitzers. Clevedon's service records do not survive, but his nephew relates that he sustained head wounds while in the Army. 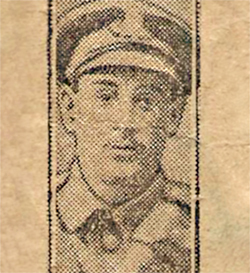 He was discharged on 13 August 1918 and was awarded the Silver War Badge (which confirms that he had suffered a wound or serious illness rendering him unfit for further service), and later the British War Medal and Victory Medal. His service is commemorated on the plaque in the village hall. As a result of the wounds he received, Clevedon did not work after the war and suffered frequent fits which are thought to have contributed to his early death on 8 February 1931 in Frampton. Clevedon Wells Fryer was buried in St Mary's churchyard three days later. Three of his brothers also served during the war : Christopher Charles, Edgar John and Walter Vimpany (whose address was Wotton-under-Edge).